o chronicle of old gliders would be complete without a description of the one that could out-climb all others and often out-perform them as well. 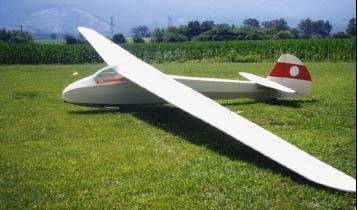 For this sailplane, in spite of its 16m span and poor handling characteristics, was the beginning of the standard class idea of a cheap sailplane. 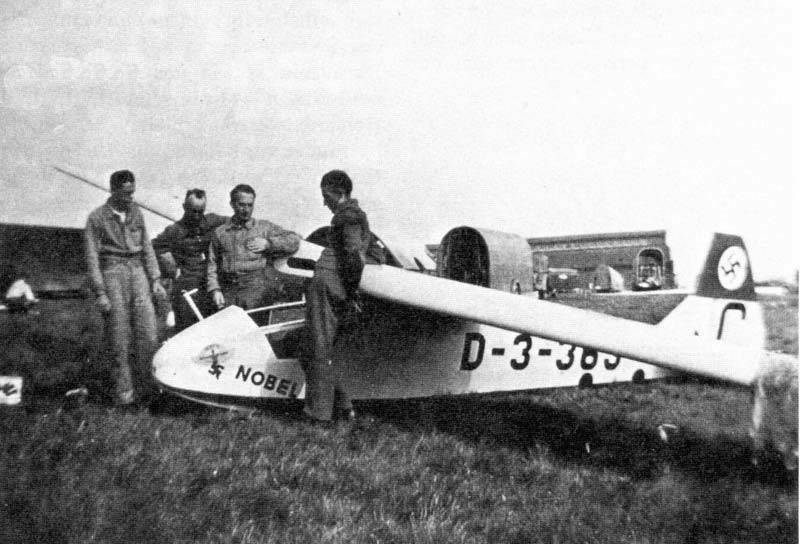 Egon Schelbe, together with students from the Flugtechnische Schule (known briefly as the FFG Munich), developed the welded steel tube fuselage for use on all the FFG’s sailplanes. 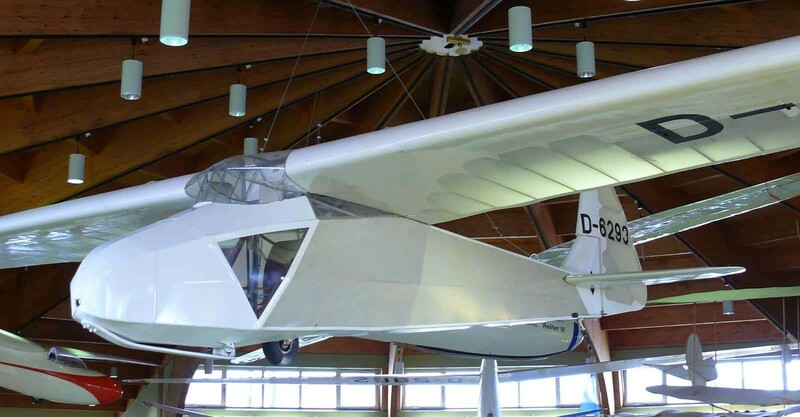 These aircraft became known as the “Munich School” and they pointed the way to cheaper glider production by reducing the building cost by almost a half during the austere period in Germany after 1951. 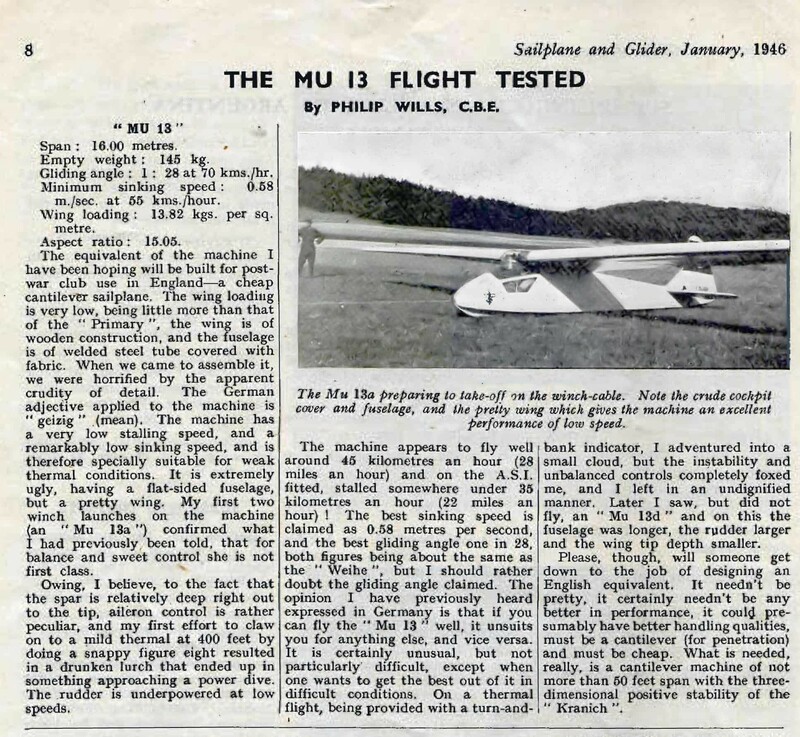 The story of the Mü-13 began in 1932 when Egon Schelbe, who had taken over the leadership of the FFG Munich, designed and built the two-seater tandem glider, the Mü-10 Milan. This machine, flown by Ludwig Karch, made outstanding flights over and through the Alps. The two prototypes were very similar. Each was designed to be fitted with a small engine. Kurt Schmidt envisaged the use of a 12/14hp motor. The Merlin’s engine was to be fitted to the nose; the Atalante was to have a retractable engine mounted above the wing centre section. Each was designed with a retractable double wheel undercarriage, though it Is not known whether these were ever fitted. The wings of the Mü-13 are refined wood structures, using the FFG Munich’s own profiles. 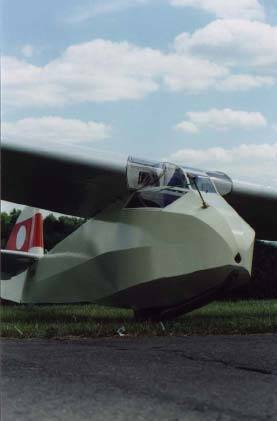 The ailerons and flaps, fitted only on the prototypes, were of welded steel tubes. 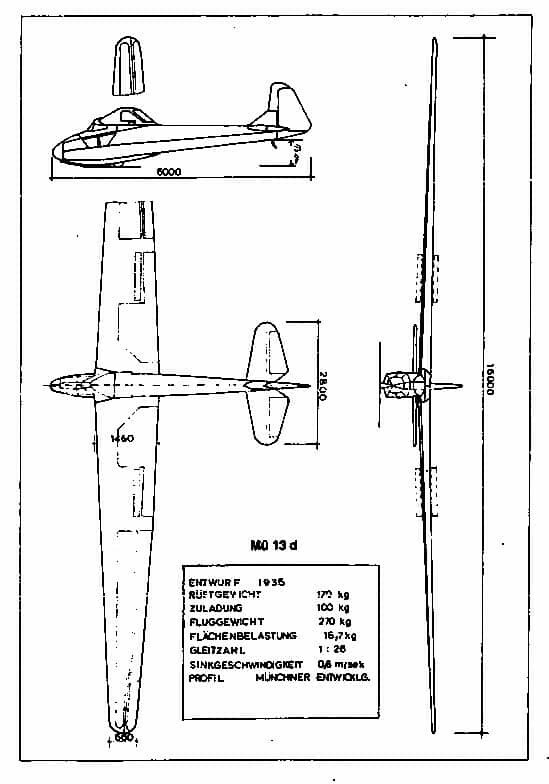 The wing/fuselage attachment arrangement on the Mü-10 and Mü-13 were unusual. One wing was attached to the fuselage at two points on one side and a forward point on the other side. The second wing was attached to the spar of the first wing and to the fuselage by a rear point only. The prototypes had two-spar wings with the flaps and ailerons carried by the rear (drag) spar. The flaps could be lowered differentially for the best possible circling performance. Between 1936 and 1937 the and almost certainly also the “Merlin” received wing dihedral. 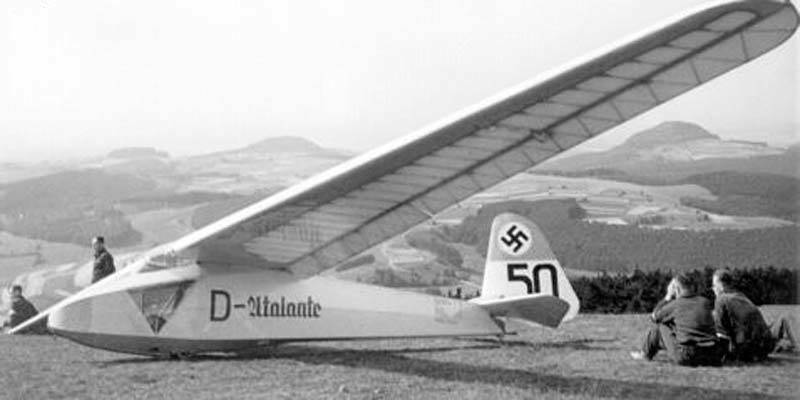 The “Atalante”, a different colour from the Ivory of the previous year, took part in the 1937 International Contest on the Wasserkuppe. Flown by Kurt Schmidt, it came 5th behind Dittmar/Fafnir 2, Hoffmann/Moazagotl, Spate/Minimoa and Sandmeier/Spyr 3 (Switzerland). Hanna Reltsch came 6th with the prototype Relher. 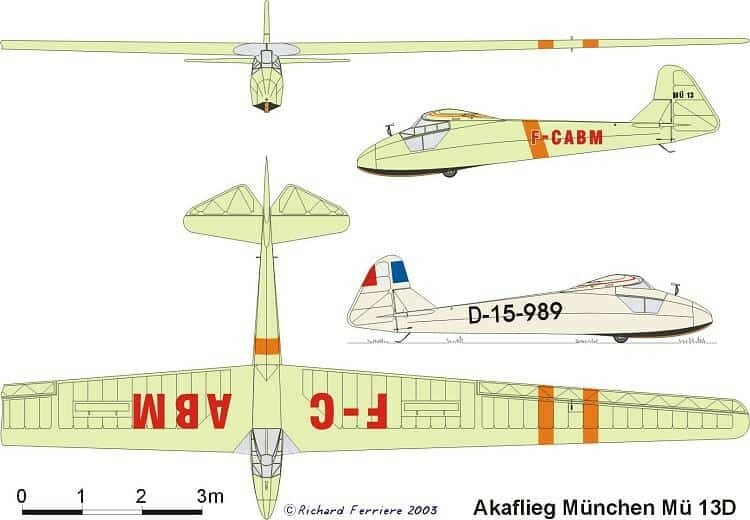 That year the Rhon Contest was won by the older Mü -10 Milan, flown by Ludwig Karch. This was the first and only time that a two-seater won the Rhon Contest. During the tremendous Rhon Contest of 1938, Kurt Schmidt and his Mü-13 “Atalante”, had to be content with second place after a desperate 14 day battle. But he was ahead of a phalanx of Relhers, Weihes, Condor 3a and Minimoas. 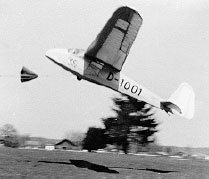 The Mü-13 was often In the lead, but lost it by a short flight on the day when Spate in a Reiher reached Rotterdam, a distance of 415km. The Mü’s longest flight was 410km to the Oder after a downwind bungee launch from the top of the Wasserkuppe and a desperate “scrape”. On the same day 21 pilots reached Berlin (320km) and Spate reached Stettin on the Baltic coast (445km). In the Rhon Contest of 1939, 15 Mü-13’s were entered in a class for junior pilots and were the most numerically entered. Ingo Passold, the brother of Rolf Passold, who flew an RF 5 at Wycombe Air Park in the late 1970s, was winner of this class. 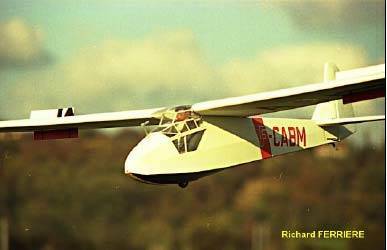 Kurt Schmidt forsook his Mü-13 for a Condor 3, and again came second to a Reiher, this time flown by Erwin Kraft. The Munich School was also represented by Bernard Flinsch in a new 15m wingspan Mü-17 “Merle”. 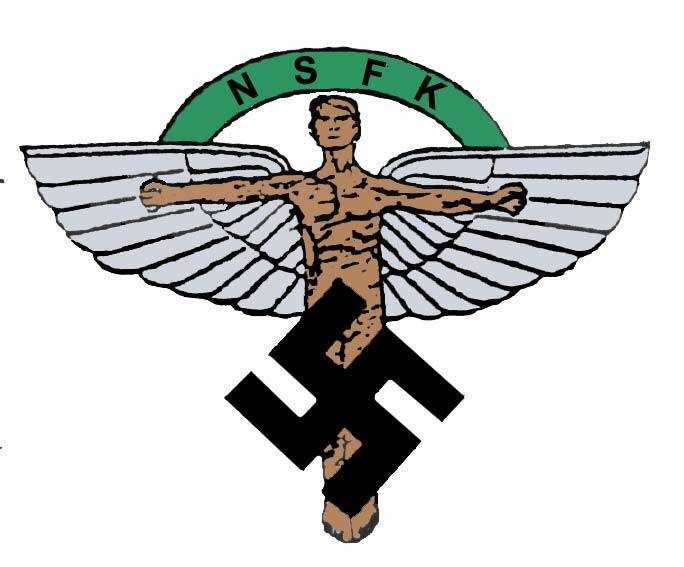 This had been designed by Ludwig Karch with a triangular sectioned steel tube fuselage aft of the wings. The theory was that the square sectioned fuselage used for the Mü-10 and Mü-13s was typical of an aeroplane type of construction, and that a triangle was stronger, lighter, and produced less drag. 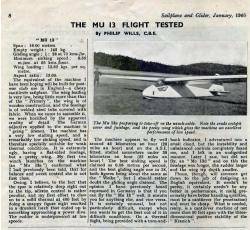 The Mü-17 was the Munich School’s entry in the 1939 Olympic Games Sailplane Design Contest in Milan. Ludwig Karch organised the buildIng of 100 Mü-17s in Prague during 1943. Most of these were destroyed on German airfields during the Spring of 1945. During the 1939 contest on the 24th May, Kurt Schmidt flew 482km from Trebbin to his adopted Bavarian home at Holzkirchen. This was almost certainly in a Mü-13, and may be the longest distance ever flown by the type. For his efforts, mainly in the Mü-13, Kurt Schmidt was awarded the gliding Prize of Honour in 1940. He was killed In 1943 whilst testing the Me 163 “Komet” rocket fighter. Also in 1939 the Mü-13 was further improved and put into series production by Schwarzwald Flugzeugbau. The design had been changed to feature more leading edge sweepback. Also the rear spar had been eliminated, as had the flaps. During the period before 1940 at least one powered version of the Mü-13 had been built and flown. 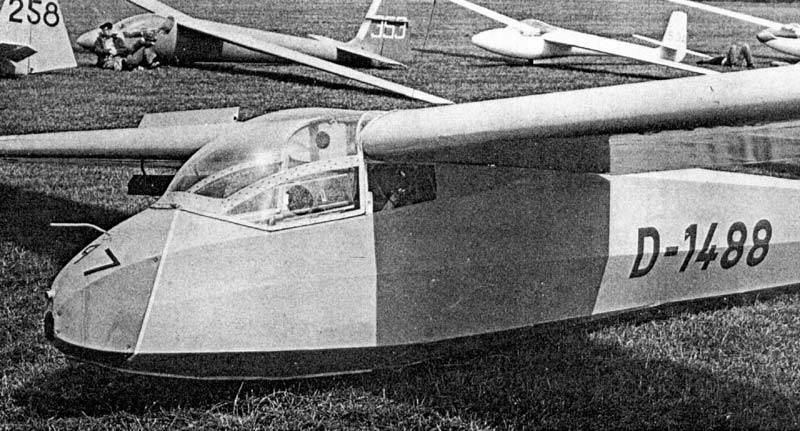 It seems that during 1943 a triangular fuselage version of the Mü -13 was also put into production. 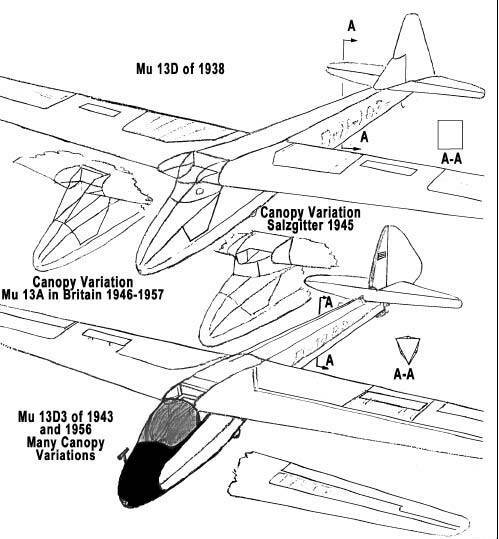 It was known as the Mü -13 D3, and had a slightly increased wingspan, considerably longer fuselage, a different fin and rudder as well as modified aileron leading edges near the tips. These modifications certainly seem to have improved the machine’s flight handling. We do not know how many of these were built, but one was seen at La Ferte Alais between 1959 and 1961 and another at Scharfoldendorf In 1950. The machine, now in England, is one of these, and another two are thought to be in Germany. One by Elchelsdorfer in Bamberg and two, similar in appearance to the 1943 version. Slight changes were made to the fittings and the elevator is a pushrod instead of cable operated. 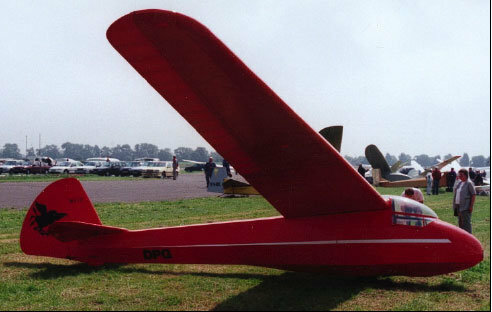 One Mü 13D3 by Weissenburg S/C in 1956. 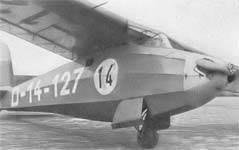 A total of 150 Mü-13 single-seaters were built. Many more Mü-13E and Bergfalkes were built after 1951, but they are completely different aircraft. During 1945, Many Mü-13s were taken to France and at least two were at Pont Saint Vincent (Nancy). One of these was destroyed in 1950; the other was still flying there In 1955. In 1945 Lt.Cdr, Stanley (John) Sproule was responsible for bringing the only Mü , as well as a Meise and two Krahichs into Britain for the Royal Navy. This machine was a Mü-13A, but how it differed from a Mü-13D is not known, though possibly it had a shorter fuselage. Flown by the Goodhart brothers, it put up outstanding performances in the 1949, 1950 and 1951 National contests at Camphill. Tony Goodhart flew his 30Okm distance in this machine. It was badly damaged In 1957 and not repaired. The figures below have been taken from “Die Beruhmtesten Segelflugzeuge” by Georg Brutting. The weights of the Mü-13d3 refer to the machine that is now in Britain. The German cockpit load has been increased because the max. permitted speed has been reduced. It is interesting that the empty weight of a 15m British built Olympia, max L:D 1:25, is about 195.5kg. Thus the Mü-13d-3 with an extra metre of span seems to be a lighter machine with a better performance. Its handling qualities are good, but probably it Is not so fast as an Olympia. 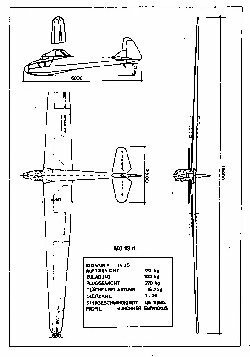 Nevertheless the Mü-13d-3 is 991bs heavier than the original Mü-13d and one can only imagine that the climb performance of the original Mü-13s must have been sensational.